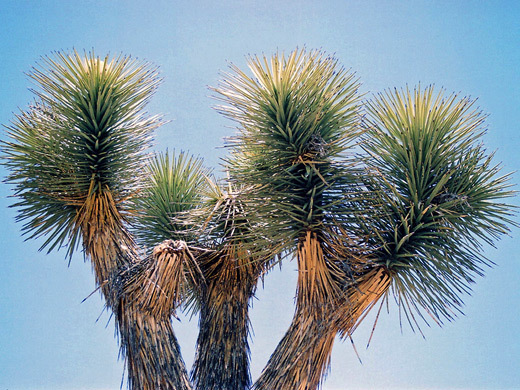 Joshua trees occur in patches across several Southwest states, wherever conditions of temperature, drainage and rainfall are suitable. Apart from Joshua Tree National Park, the plant is quite common across all the Mojave Desert and hence occurs in parts of south Nevada, extreme southwest Utah and northwest Arizona, favoring elevations between 3,000 and 4,000 feet. The trees grow strongly, for example, along US 93 between Kingman and Wickenburg in Arizona; this road is known as the Joshua Forest Parkway and seems to have even more Joshuas than the national park, intermingled with that other distinctive symbol of the Southwest, the saguaro. Two other prime locations, both in Arizona, are the Beaver Dam Mountains Wilderness and Grapevine Mesa, around the road to Pearce Ferry near Lake Mead, where particularly dense forests of old trees stretch for many miles. North of the national park, the Mojave National Preserve also contains vast Joshua plantations, especially the region north and west of Cima. One less well known location is Saddleback Butte State Park, between Palmdale and Victorville. The Joshua tree is actually a species of yucca ( Yucca Brevifolia ), that can reach a height of 50 feet and is believed to live for up to 1,000 years although they are difficult to date accurately - as they are not proper trees, there are no annual growth rings. A large cluster of white or greenish flowers can appear at the end of each stem from March to May, but this requires just the right combination of springtime temperature and moisture, and several years may pass without a major blooming. Plants start to form the familiar branched appearance when they are 6 to 10 feet tall and several decades old, with new stems forming only after a flowering. The tree was first named by Mormon pioneers in the nineteenth century, who thought that the upturned branches resembled the arms of the prophet Joshua, pointing the way to the promised land.